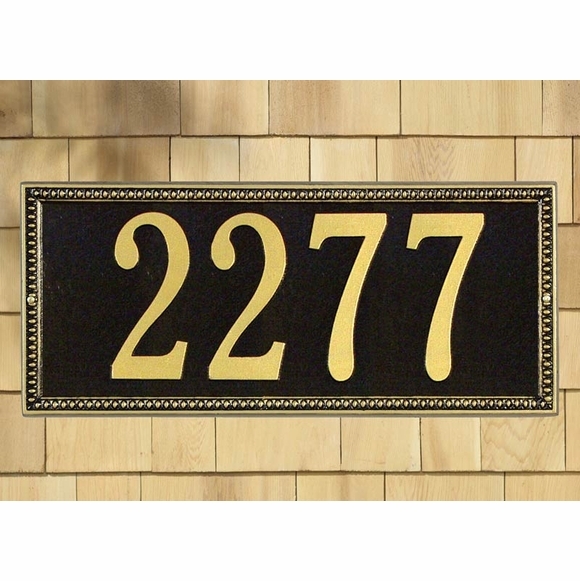 Personalized Estate Size Egg & Dart Address Plaque - - large 23.25" x 10" rectangle sign with egg and dart border. Holds one or two lines of personalization. Made in USA. One line or two lines of personalization. The one-line version holds up to five 7" numbers. The two-line version holds up to five 4.5" characters on line 1 and up to seventeen 2" characters (including spaces) on line 2. Eleven colors: AB antique brass, AC antique copper; BG black with gold characters; BS black with silver characters; BW black with white characters; GG green with gold characters; OB oil rubbed bronze; OG bronze with gold characters; PS pewter with silver characters; RG red with gold characters; and WG white with gold characters. Also available in standard 13" x 7.25" size (see Related Products). The classic egg & dart border has its roots in ancient Greek architecture and is a popular embellishment on arch moldings. We just loved the house numbers. They were exactly as described. In addition, the plaque felt strong and sturdy, not at all flimsey.